Please contact us through the form below with questions, comments, or feedback of any kind – we’d love to hear from you. We will respond during our regular business hours. 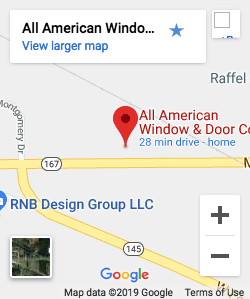 All American Window & Door Co., Inc. does not collect any personal data on persons visiting this website. If you choose to contact us through e-mail or by submitting forms through US mail, the information you provide will only be used by All American Window & Door Co., Inc. for fulfilling your request(s). Your information will then be stored by All American Window & Door Co., Inc. and will not be given or sold to any other companies or individuals.